Have you ever been in church, or on-line reading blog posts, or just conversing with a good friend when something they said just is like a dagger to your heart with how much truth it speaks? Love those times . . . sometimes. Me trying to be less hypocritical about fitness! 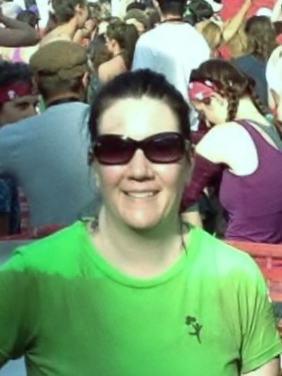 Warrior Dash 2013. As a Christian, I am tired of being called a hypocrite. There’s been a story floating around Facebook (cannot verify its veracity) about a new minister that dressed as a homeless person and attended his own services in this disguise. The post laments how no one came up to speak to him or welcome him in any way and then the minister, in this outfit, goes up to the pulpit and gives a sermon on– well, you get my drift. Then there is comment after comment about “This is exactly why I left the church!”– even one from my own relative. Honestly, it makes me mad because I think two things. Did said I’m-dressed-up-as-a-homeless-man-minister actually offer to shake anyone’s hand? Did he take an initiative, despite his dress, to get to know a few people? And those that use this example as the reason they left their own church– why aren’t you out there greeting people? Be the change you want to see. Well, now . . . ouch. It dawned on me that hypocrisy doesn’t just apply to aspects of the Christian life but to all aspects of our life. For years I said, “I want to be published.” but what was I really doing to accomplish it? That gap between my words and my action is hypocrisy. These words hit home most for me in the area of weight loss. About three years ago, I saw a photo of myself and it was like a very bright spotlight on the lie I had led myself to believe. I knew I was a little fluffy– but not obese by any means. Everything changed when I saw that photo. A dagger right into my heart. I couldn’t deny the truth anymore. Well, of course, I could but I knew I never wanted to see another photo like that . . . ever. So I started on a wellness path . . . very slowly. It’s taken me about three years to lose forty pounds but I’m not quite there yet. Quite honestly, I should be at my goal weight. I have plenty of excuses why– or what we call “reasons” when we’re living in hypocrisy. Some of them sound very good and reasonable but they’re really not. I’m trying to decrease my “reasons” and increase my actions. I don’t want to be viewed as a hypocrite. I want people to believe that I’m going to do what I say I’m going to do. How do you plan to change it? And yes, all my ranting about the church above was being hypocritical, too. I have lots of self discovery in process. This entry was posted in Encouragement, Writing and tagged change, Hypocrisy, Hypocrite, Jordyn Redwood, Peril, Poison, Proof by Jordyn Redwood. Bookmark the permalink. I’m surprised by how moved I felt by your post. I always think I lack discipline, but I realize that I just need to commit to what I actually want and take action, stop making discipline an excuse. Thanks for sharing. Thank you for your kindness. What goal are you working toward? I’ve been working on a novel and various writing projects so that one day I have the funds to give my mom all the things she deserves. She’s had a hard life I want to make it easier, but sometimes that weight I’ve put on myself gets in the way and I beat myself down. Wow, that’s a pretty amazing goal and what a GREAT heart you have. Sometimes focusing on smaller goals is easier to think about. Many blessings to you. Wishing does not work, does it? We have to be committed. And it is easier to find someone else who lacks more character than we do. Only we are blind, blind, blind. Why can we never see our own hyprocisy and self righteousness. I can get all bound up in righteous indignation about this subject. Yep! I would guess pride. I have too much of it. I thought I had left a giggle at the end of my reply to indicate I knew we can call something righteous indignation to justify what is actually self righteousness once again. It is a never ending battle that we cannot give up. This blog hit home, as I’ve recently been thinking this about myself lately. I have tons of excuses for not eating better, working to lose weight, quitting smoking, exercising. My excuses are endless, and nothing changes. I want to change my behavior, not keep justifying it all, and I’ve been working towards those goals this last week. It’s not a lot of progress, but it is a start! Thanks for this awesome post- I’ll be sharing! Great job, Kay! Sometimes I think getting started IS the hardest hurdle. Keep going. One day at a time. Oh, Jordyn, how true this is, and ouch – the truth hurts! Intention is good, but commitment makes things happen. Thanks for calling us to task about our hypocritical tendencies. The strategy that seems to be working for me now is writing a very short list of priorities for each day and absolutely sticking to it – no excuses. It’s hard work! Great post, Jordyn. Hits home.